09 MarNew Flooring? 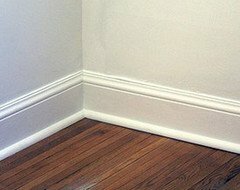 Is Your Baseboard Properly Painted? You just had new floors installed and you couldn’t be happier with the look. The installer told you he would replace your quarter round trim – the rounded molding at the bottom of the baseboard – and he did. So everything looks great and the project is finished, right? Wrong. Remember, floor installers stick to flooring! 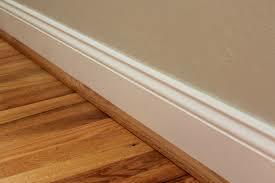 Quarter round trim is part of the baseboard, not an extension of the floor. If you have white or off-white molding, the quarter round or shoe molding should be white, too. The floor installer will use the same color as the floor color to save both time and money. To make it white would require them to caulk and paint it! If your quarter round is wood colored, it’s not a problem! LaffCo. Painting does 20 jobs a year where we have to change the Shoe molding to white. The process is a little tedious so it is highly recommended that you hire a professional. I will list the steps below. Depending on the molding type and color, you may have to use oil-based primer to seal in the wood tannins. Determine this before beginning. Composite flooring does not need oil. Natural wood with a clear coat of Polyurethane most likely will not need oil – test a small portion first. Unfinished wood or non-polyurethane wood will most certainly need an oil primer. All of it will at least need some type of primer. After you determined the primer type, you must caulk the gap between the quarter round (shoe molding) and the baseboard. The idea in the end is to have it look like one piece of molding! Also, fill any and all nail holes. Tape the floor very carefully using Scotch Blue Painters Tape or Yellow Frog Tape. Any other type of tape will not work properly and could harm your floors. Prime the quarter round and let dry 1-2 hours. Finish coat the quarter round – one coat only! Finish coat the entire baseboard (one coat) so it all looks perfect and new. A minor part of your room like white quarter round can make all the difference in the world between your home looking complete or just pieced together. The details matter! Seem overwhelming? Let LaffCo. help finish your next flooring project properly! Contact us for a quote today! Laffco Paint was an excellent service. The painters are very professional and the work that did its fantastic. Very highly recommended.